treatment for TASC A and B primary aorto-iliac occlusive (AIOD) disease, and the first-line approach for TASC C lesions [1,2]. Vascular surgery and medicine focuses on diagnosis, treatment and comprehensive care of patients with diseases of the arterial, venous and lymphatic systems. Archives of Vascular Medicine aims to publish a comprehensive array of manuscripts encompassing treatment plans, conservative management, causes and risk factors approaches towards vascular diseases. 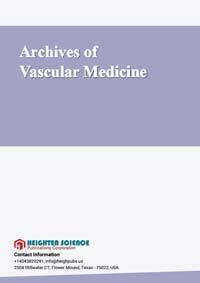 The scope of Archives of Vascular Medicine comprehends in publishing and exhibiting compassion and commitment in augmenting proficiency in vascular surgery and medicine. The credibility and standing of vascular surgery in the medical and surgical community is directly proportional to the quality and number of research contributions by vascular surgeons. Introduction: Endothelial progenitor cells (EPC) are involved in vascular repair and proliferation, contributing to the long-term outcomes of apheretic treatment.